Our recent study that covered the intentions and observations of 534 buyers, advisors and providers with their sourcing strategies, in the event of this seemly ever-present threat of a “Double-Dip” Recession, revealed what is motivating buyers to outsource in this current climate. While eliminating cost is an ever-present obligation, buyers are also equally focused on achieving greater flexibility to scale and support their global operations - and even more significantly - prepared to explore adopting standardized business processes. The ability to develop some best-in-class processes as "Business Platforms", whether they focus on horizontal or vertical process clusters, is becoming a real differentiator in the market, as buyers seek more standardized solutions from their outsourcing engagements. Moreover, more process standardization leads to more Cloud-based BPO services where clients can easily tap-into these Business Platforms without having to grapple with cumbersome on-premise software and expensive licenses, or contend with resistance from awkward internal IT staff. In short, buyers can start to look at moving from “A to C” with adopting quality standard processes and miss out much of that painful “B” phase (which is often where many get stuck unto perpetuity). 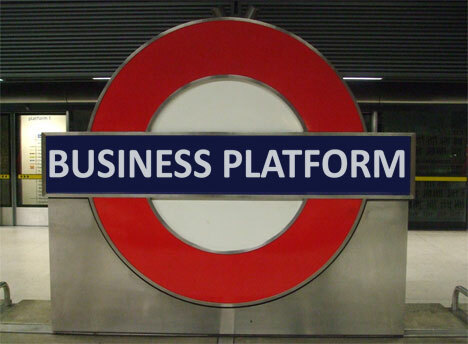 So what are Business Platforms? Business Platforms, enabled by the fusion of Cloud Computing, SaaS and BPO innovations in an integrated singular managed service, are emerging rapidly as the desired “one-to-many” utility service provision for providers and a new source of value for outsourcing buyers. Buyers can now explore transitioning more rapidly to a desired future state for a specific business process, or set of processes. The gauntlet being laid out to providers, with these Business Platforms, is their ability to support their clients’ transitions quickly and inexpensively. Simply selling “products” is not the concept of business platforms – it is the provider’s ability to work with their customers to facilitate and support the ultimate business outcomes of managing the processes associated with the Business Platform offering. Well-executed Business Platforms provide customers with compelling technology-enabled business process services that help drive innovation via process re-engineering, greater business agility and productivity improvements. They are flexible and scalable in the face of global demand fluctuations and provide high-quality process workflows. The days of clients being able to spend multiple-millions of dollars to transform processes as part of a complex outsourcing transformation are fast diminishing. Subscribing to Business Platforms that consolidate infrastructure, middleware software, labor, and process/domain expertise including future investments, as OPEX is attractive to clients. Cheaper to get started, and with output or outcomes-based fees, Business Platforms align with the current budgeting trends evident in the market. Buyers of non-core operational processes do not want to go and ask for CAPEX in this economic climate. Click here to download our new RapidInsight, "What Are Business Platforms and Why Do They Represent the Future of Outsourcing?" Which processes in HCM would most companies NOT standardize and outsource? Think it depends on industry, company's secret sauce, or competitive differentiaters. I think you hit on a key point when you said "...it is the provider’s ability to work with their customers to facilitate and support the ultimate business outcomes of managing the processes associated with the Business Platform offering." This is a strong calling for providers to step beyond the product/package mentality and focus more on the outcome based results their platform can bring. I'm curious as to why the "availability of proven offerings" has such a low motivating factor. I would think the having proven offerings would demonstrate the ability to provide a strong platform.